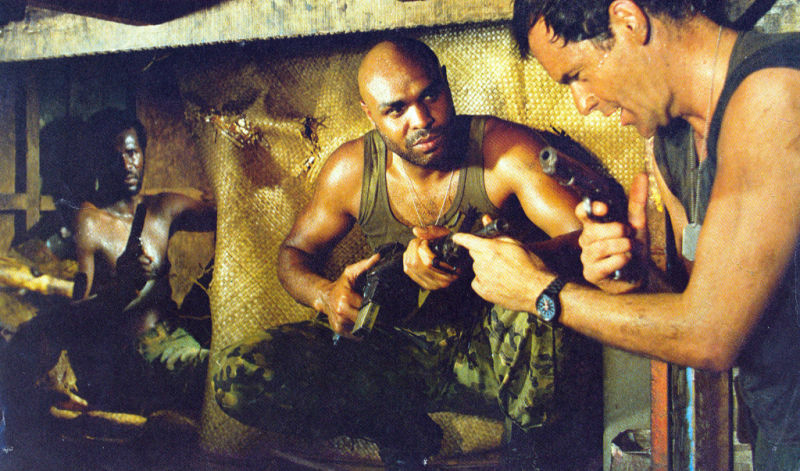 Tony King, Bobby Rhodes and David Warbeck in L'ULTIMO CACCIATORE, aka THE LAST HUNTER. Q: What about Bobby Rhodes? Ah! Now Bobby Rhodes, he's an absolute sweetheart. He's an Italian black. Q: Really? Does he speak English? Oh, he speaks very good English. I bumped into him outside the railway station not so long ago. Great big guy. Q: He's massive isn't he? Looks like a killer! He's a pussycat, he's so sweet. Q: He's always in Margheriti's films... And he recently made that Western with Castellari, JONATHAN OF THE BEARS. He's dressed just in white and he's big and powerful, on a horse, shiny black head. He looks so imposing. Oh he's a sweet guy. He knows what to do and he's so modest, almost embarrassed all the time and quiet and gentle.